The town is still cut off from all help by snowstorms and pack ice; the local police have lost both the victim's body and the only suspect. Unable to prove his suspicions about the ferry captain, Andri finally gets a new lead when people start sharing photos of the corpse online. The missing children and fleeing murder suspect are both found, the latter considerably worse off than the former. 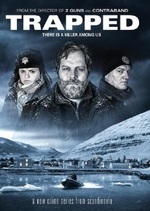 Nobody can get out of the tiny fjord town, the Reykjavik police can't get into it to take over the rapidly unraveling investigation, and everyone is getting a little claustrophobic and anxious - particularly harbor master Sigurður, who finds himself leaned on by mayor Hrafn and aspiring hotelier Guðni to get his father to change his mind about selling the family home to help pave the way for the new, improved port. Police chief and resident teddy-bear-man Andri, at his wits' end and reluctant to admit to forensic specialist/frenemy Trausti in Reykjavik that the investigation is already going very wrong, enlists help to find more body parts. There's success, but they find more than they bargained for and the investigation suddenly takes a surprising turn. In personal, non-blurby observations: Hjörtur is growing on me a lot. Season one of Trapped, in its entirety, is available on Amazon Prime; season two is tentatively set to return this fall.